Barrington Lewis: Should the super rich be taxed more? Or receive tax breaks? Should the super rich be taxed more? Or receive tax breaks? It is all over the news about whether the super rich (the top 10%) should be taxed at a higher percentage than the bottom 90% of Americans, or if these high net worth individuals should be given a tax break. Some middle class and poor Americans (the bottom 90%) believe that the super rich should be taxed at a higher percentage to cover the high costs of the healthcare reform, Medicare, Social Security, and any other expenses or defaults that our country may have. Billionaire Warren Buffet made a case to Congress in 2007 that the current tax code is unfair to lower income Americans, and that he pays 18% of his salary to the IRS while the rest of his staff pays nearly twice that - 33%! Buffet stated to lawmakers that "frankly, an economy where my receptionist pays a lot higher tax rate [than] I do does not strike me as a just economy." But on the contrary, other super rich individuals believe they deserve tax breaks and should not be "punished" for being richer than most by paying extra taxes to cover the cost of those who aren't as fortunate or those that don't work hard enough. Some say that if the government continues to increase taxes on the super rich Americans who have more income, then most Americans will not be as motivated to achieve higher salaries because the government will take their hard earned money through taxes and give it to the lower income Americans. What I consider interesting is how currently most super rich Americans use the tax code to their advantage. 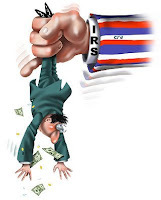 Many super rich Americans either have a low salary or no salary at all - which means the IRS cannot tax all of their wealth with an income tax. For instance, the boss of Blackstone Group, Steve Schwarzman, has been named the best paid CEO with a compensation of $2.3 million dollars which the IRS will tax at the highest rate of 35%. However, you may find it interesting that according to WallStJournal, Schwarzman also received an additional "$699.8 million from the vesting of 25% of the equity granted from [Blackstone's] June 2007 IPO. That is on top of the $684 million he cashed out on in the IPO and doesn't include the balance of his equity grant that will hit in coming years." One can see that although Steve Schwarzman has a salary, or taxable income of $2.3 million, he also has additional gains not subject to income tax, but rather capital gains tax, which is currently at 15%. If you add the sum of $699.8 million and $684 million, the total is $1.38 billion that is only subject to capital gains tax! In 2008, the 2nd richest man in the world, Warren Buffet, with a estimated net worth of about $60 billion - has a salary of just $100,000 that is subject to income tax - the rest of his fortune is taxed at the current rate of 15% in capital gains tax. So should the super rich pay more in income tax? Or more in capital gains tax? Or should they receive tax breaks since they pay so much already? Who's wrong? Who's right? What is considered fair...? You tell me! Or if you're one of those considered to be in the bottom 90%, then maybe you should just make more money.....?? ?